Supersize your tomatoes with the amazing Tomato Giant Trees. It lets you produce up to a total of 180 lbs of tomatoes for less than a penny piece. 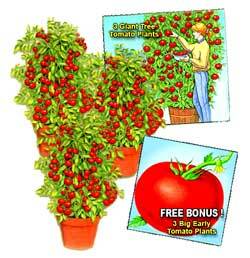 These tomato trees will zoom to an amazing 8 feet or even taller in just 90 days. You can grow tomatoes at big as grapefruits. These tomatoes can be up to 2 lb. each. Tomato Giant Trees is a virtual tomato factory. You get a new crop of farm fresh tomatoes every week. The tomato trees produces wonders for your garden. You and entire family will love juicy, red, ripe, jumbo sized tomatoes. Use them on salads, pizzas, or just eat them fresh off the tree. This product is amazing. I was able to grow plenty of big tomatoes. Do yourself a favor today and give this a try.